Adelaide Dragons Red won the first Australian Interstate Bhutanese Soccer Tournament beating Melbourne’s Thunder Dragon Club by 1-0. The Adelaide team had entered the final after winning Cairns by 4-3. 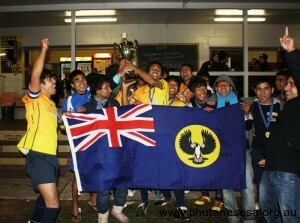 Suraj Rai for Adelaide Dragon Red had scored a goal that secured the team’s victory. Adelaide Dragon Blue, another team from Adelaide lost to Cairns on the first day. Adelaide Dragons were supported by ARA Jobs, MYSA, Multicultural SA and various local councils. congrats guys !!! great first national win. . hope its first of many !! !